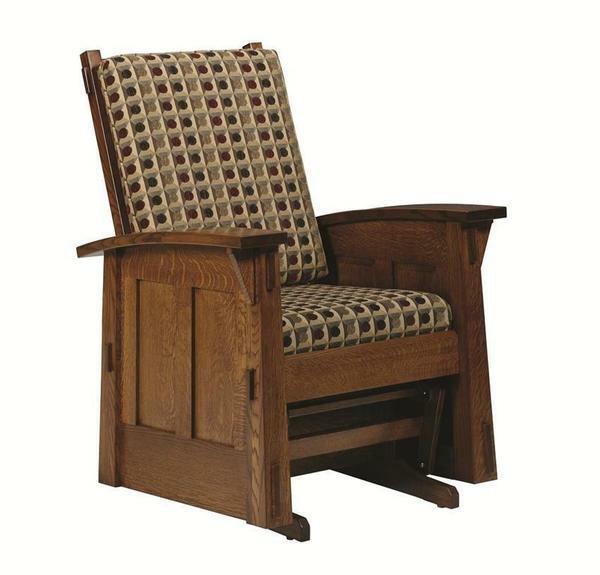 Our Amish Olde Shaker Glider Rocker is a combination of elegant looks and durable construction. The rocker is a great standalone piece of furniture, but works even better when paired with our Amish Olde Shaker Glider Ottoman to prop your feet up on. Our team, here at Dutchcrafters, commented specifically on the comfort provided by the curved arm rests on chairs such as this one. The exposed tenons and paneled sides represent a transitional look that everyone can appreciate, while serving another purpose of covering up the metal parts that help the rocker glide so smoothly. This glider does not recline, however if you're looking for a reclining glider please check out our beautiful Amish Olde Shaker Recliner! Choose from our selection of varnishes, wood, and fabrics to make your rocker into one that fits your home. Handcrafted in the USA, our furniture is made to suit your preferences! Whether you are shooting for a retro, vibrant fabric or a more traditional solid design, our Amish woodworkers put hours of passion and care into every order. Talk to one of our furniture specialists about our variety of fabrics and finishes.